1. Remove the monitor from its stand by removing the mounting screws from stand. Recommended: Save the stand and hardware in the original box for three years in case you need warranty service. 3. Lay the monitor facing down over the foam pad. 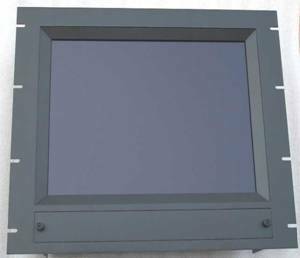 This photo is that of a similar TFT LCD monitor. 5. Place the rear bracket subassembly over the monitor. Next, check the depth of the VESA mounting holes with a paper clip. Then put a No. 8 lock washer, then a No. 8 flat washer on each of the four metric screws; see if 4 mm X 12 mm, 4 mm X 16 mm, or 4 mm X 18 mm metric screws fit better. Then insert the screws with the washers into the mounting holes. Hand tighten all four screws first. Then tighten the screws with No. 2 Phillips screwdriver. 6. Turn over the assembly with the monitor screen facing up. 7. Gently place the front panel subassembly over the monitor. 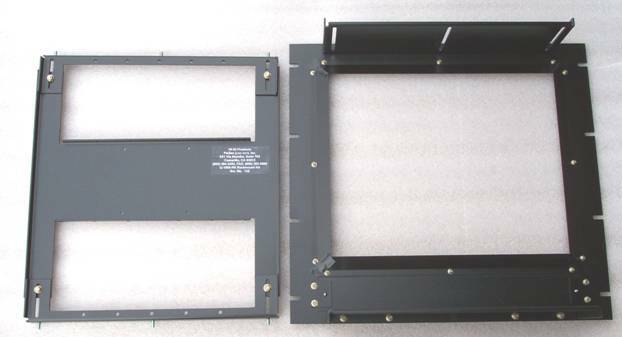 Slide the upper and lower “U” brackets of the rear bracket subassembly into the corresponding slots in the “L” brackets of the front panel subassembly. Insert a No. 10 flat washer and a 10-32 locknut onto each stud on each “U” bracket. 8. 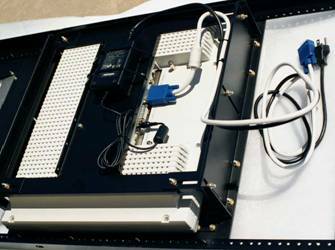 Adjust the alignment of the front panel subassembly with the monitor. 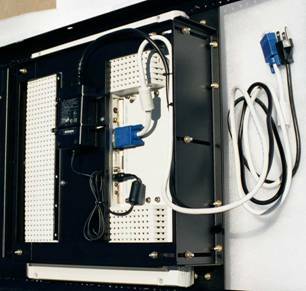 When the front panel is well aligned with the monitor, tighten three 10-32 locknuts on the upper “L” bracket and three locknuts on the lower “L” bracket with 3/8” socket wrench. Also, tighten the 10-32 locknuts to secure the “U” and “H” brackets. 9. 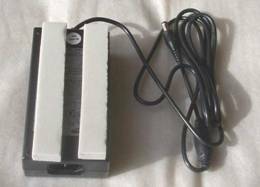 If your monitor has an internal power supply. Then skip to Step 13. 10. Connect the power adapter connector and the PC connector to the monitor. 16. Use wire cutter to trim all excess lengths of tie wraps. 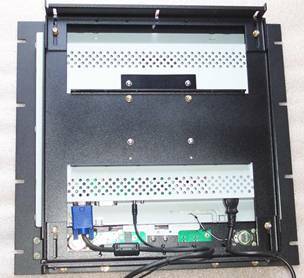 Next, mount the rackmount monitor assembly to a 19” rack with eight black 10-32 screws provided. Blank cover plate Cover plate with speaker holes. 17. Connect the power cable to a power outlet. 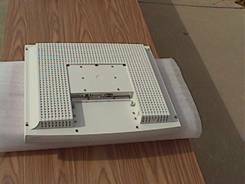 Connect the VGA cable to a computer. 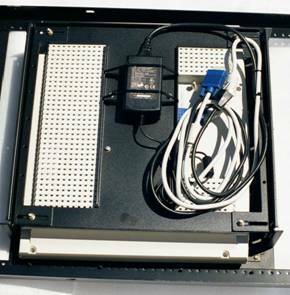 The controls for the monitor are behind the cover plate. Remove this cover plate to get to the controls. 18. Power up the computer and monitor. The best way to adjust the monitor display is to use the “AUTO” button. For personal preference, use the “MENU” button to make specific adjustments on brightness, contrast, color, etc. If needed, use the monitor’s operating manual for more instructions. When done, re-mount the cover plate. 19. Congratulations! You have done it! 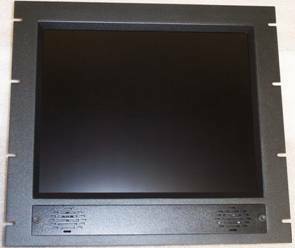 If you have any questions or comments, please call Harry Lee, 1-866-484-2454 or e-mail to hlee@flatmonitors.com.